I got some MOO cards a while back, but I'm home sick with a(nother) cold so I thought I'd discuss. Do you know about these? Am I the last one to know about these? You choose up to 100 images from your flickr set, and the MOO folks print 100 wee cards with the contact info of your choosing on the back. If you choose 25 images, you get four of each, if you choose 100 you get one of each, etc. They're about half the size of business cards. Though I risk sounding like an ad - I don't generally do product reviews on my blog - I love these cards. They're pricey - $20 for 100 - but the quality, both the image and the paper, is incredible. They're thicker and more heavy duty than your average business card, more substantial, and they feel very satiny/matte and professional. Love. I want to keep them. I think I'll make two piles - MOOs to keep and MOOs to give. Guess which pile will be bigger? If you have some MOO cards, too, let me know and maybe we can trade, just like Laura Ingalls Wilder and her friends traded their name cards in, was it, These Happy Golden Years? I think? If I think about that book any longer I'm going to start weeping so I think I'd better wrap this post up, pronto. I just had to comment to give you snaps for the These Happy Golden Years reference. I remember reading that book and feeling so excited, inspired and delighted by the elegance of it. I'll trade a card if you like! I've heard about these things but never seen one - very nifty and somewhat victorian, don't you think? Having worked in a stationery store before, they remind me of "calling cards" - usually smaller, with less contact info, and used in more casual or social situations. If I ever get my moo cards, I'd definitely be up for a trade. Guess I should upload more images to Flickr! I LOVE my moo cards too. Aren't they amazing? Some of the ones I ordered I don't want to give away. I have half of them up on my bulletin board above my sewing machine If you want to trade, count me in! i got moo cards right before a craft show and boston and they were gone by the end of the day. i must get more - i love them so (and laura ingalls wilder - i totally remember that). 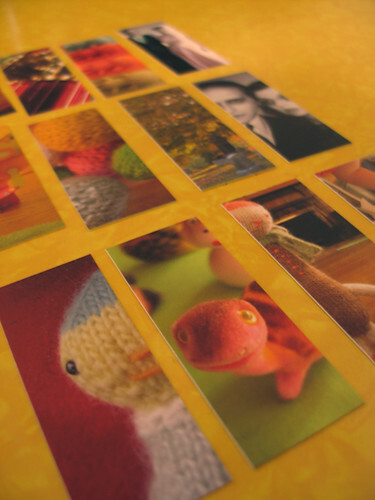 I"ve been bookmarking my flickr photos until I had enough "good ones" to make my moo cards. Now, after reading your post and the comments here - I might stop worrying about getting "enough" pictures... sounds like I'm going to want to keep half of them! Ah - LIW... have we already had the discussion about reading the books as a child vs reading them again as an adult??? i have been meaning to do moo cards. what did you do for the text on the back? this is the third Laura Ingalls Wilder experience i have had this week. those books rocked my world. did you go as her for halloween ever? Let's trade! I send you a few of my favorites if you'd like. I love my MOOs. Thanks Laura - I forgot to mention the text on the back. I put my name, email address, and website back there, which I figured was just the right amount of information. I'll trade some with you, if you want?